Subscribe to the Morbid Anatomy mailing list by clicking here. New book with over 1,000 images exploring humankind's relationship to death. Order a copy here. The Morbid Anatomy Museum is now permanently closed. Thanks to everyone for two and a half wonderful years! Click here to find out about upcoming Morbid Anatomy events. Visit The Morbid Anatomy Flickr Collection. Want to contribute to the holdings of the Morbid Anatomy Library? Find out what books the library is still lacking by clicking here. Click here to view the Morbid Anatomy photo collection of forgotten, curious, and overlooked museums. National Museum of Health and Medicine - Washington, D. C.
Obstetrical Museum "Giovan Antonio Galli"
Museum of Sepulchral Culture, Kassel, DE. Smithsonian National Museum of Natural History - Washington, D.C.
ASCI : Art & Science Collaborations, Inc.
Jeweled skeletons and book party with Dr. Paul Koudounaris, author of Empire of Death (image above, from the book)! Taxidermy! Ex Votos! Wax reliquary dolls! Full info follows on all events; Hope to see you at one or more! Students will be provided with pre-skinned and tanned chicken hide elements (wings, tails, heads, etc) along with millinery hardware and all the glues, threads, chain, and miscellaneous decorative elements to create a one of a kind custom taxidermy headpiece. Starting with the malleable hide parts, students will be instructed on how to manipulate, fill and and position the feathered sections while anchoring them to the metal hardware using foam mannequin heads (provided) for stability. Millinery accents like netting, crinoline, jewels and metal embellishments can then be added to complete the students' own personal design, finishing off the workshop with instruction on lining the inside and adding a personalized garment tag. Students will leave with their new wearable piece of fashion taxidermy, along with printed out lesson sheets and sourcing info so that they may employ these new skills for life. Philadelphia’s premiere rogue taxidermist, Beth Beverly specialises in wearable taxidermy. Her hats have won awards at the Devon Horse Show, Brandywine Polo and Radnor Hunt Clubs. Her work has been featured in The New York Times and The Wall Street Journal, plus galleries such as La Luz de Jesus, Art in the Age and Michael Vincent Gallery. In 2010 Beverly won "Best in Show" at the annual Carnivorous Nights competition in New York. Currently featured as an "Immortalizer" on AMC's series about competitive taxidermy, she relishes in being photographed wearing her work and defying common stereotypes of taxidermists. Anthropomorphic taxidermy--in which taxidermied animals are posed into human attitudes and poses--was an artform made famous by Victorian taxidermist and museologist Walter Potter. In this class, students will learn to create--from start to finish--anthropomorphic mice inspired by the charming and imaginative work of Mr. Potter and his ilk. With the creative use of props and some artful styling, you will find that your mouse can take nearly whatever form you desire, from a bespectacled, whiskey swilling, top hat tipping mouse to a rodent mermaid queen of the burlesque world. In this class, Divya Anantharaman--who learned her craft under the tutelage of famed Observatory instructor Sue Jeiven--will teach students everything involved in the production of a fully finished mount, including initial preparation, hygiene and sanitary measures, fleshing, tail stripping, and dry preservation. Once properly preserved, the mice will be posed and outfitted as the student desires. Although a broad selection of props and accessories will be provided by the instructor, students are also strongly encouraged to bring their own accessories and bases; all other materials will supplied. Each student will leave class with a fully finished piece, and the knowledge to create their own pieces in the future. We use NO harsh or dangerous chemicals. Everyone will be provided with gloves. All animals are disease free. All animals were already dead, nothing was killed for this class. Please do not bring any dead animals with you to the class. An Ex-voto is an offering made in fulfillment of a vow, usually offered to a particular saint or other divinity. The term is Latin in origin, short for ex voto suscepto –“from the vow made." Ex-votos are placed in chapels, shrines, and other places of pilgrimage to offer thanks for blessings, healing, and to seek grace. Such places of pilgrimage have been found throughout history and in such diverse places as Egypt, Italy, and Mexico. As ex-votos are often associated with miraculous healing, the forms they take reflect the healed body part. Hearts, lungs, legs, arms, heads, breasts, crutches, etc. often find themselves replicated in embossed and sometimes painted metal which adorn the walls of chapels in fantastic array. They are sometimes accompanied by written verse as well. Such ex-votos stand not only as tokens of thanks, but also as testaments of faith to other viewers. This class will demonstrate how to construct from sheet metal an ex-voto of one’s own choosing. Using metal sheers and embossing tools, students will learn how to lay out a design and create their own individualized ex-voto suitable for hanging on a wall (chapel or otherwise). Metal and tools will be supplied. Samples will be shown, as well as anatomical images suitable for reproduction. Please bring sketchpad and pencil. Karen Bachmann is a fine jeweler with over 25 years experience, including several years on staff as a master jeweler at Tiffany and Co. She is a Professor in the Jewelry Design Dept at Fashion Institute of Technology as well as the School of Art and Design at Pratt Institute. She has recently completed her MA in Art History at SUNY Purchase with a thesis entitled Hairy Secrets:... In her downtime she enjoys collecting biological specimens, amateur taxidermy and punk rock. Tonight, Dr. Paul Koudounaris--author of Empire of Death, the definitive book on ossuaries--will present a heavily illustrated talk based on his new book Heavenly Bodies: Cult Treasures and Spectacular Saints from the Catacombs, the story of skeletons discovered in the Roman Catacombs in the late sixteenth century. These largely anonymous skeletons were presented as the remains of Early Christian martyrs, and treated as sacred. They were sent to Catholic churches and religious houses in German-speaking Europe to replace the holy relics that had been destroyed in the wake of the Protestant Reformation. Here, the skeletons would be carefully reassembled and richly adorned with jewels and precious costumes by teams of nuns. Intended as flamboyant devotional items, they are now considered some of the finest works of art ever created in the medium of human bone. 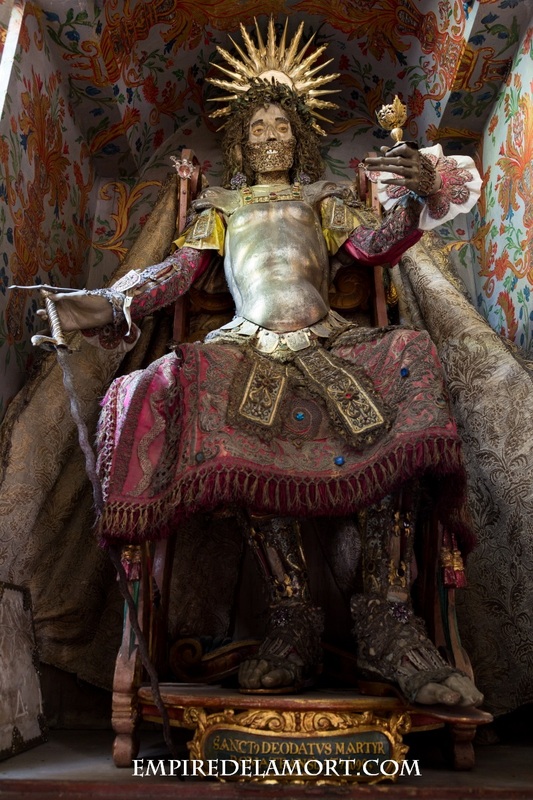 As time passed, faith in these sumptuously decorated skeletons--once an important part of the spiritual life of many people--wavered, until finally they were cast out during the Enlightenment as remnants of a superstitious and embarrassing Catholic past. Largely forgotten in the annals of religious history, Dr. Koudounaris gained unprecedented access to religious institutions where the surviving decorated skeletons are held. His photographs are the first that were ever taken of many of them, and the images which will accompany his lecture are bizarre, moving, and beautiful. Dr. Paul Koudounaris holds a PhD in Art History (UCLA) and has taught classes at numerous universities and published in magazines throughout the world. He is the author of The Empire of Death, the first illustrated history of charnel houses and religious sanctuaries decorated with human bone. Named one of the ten best books of 2011 (London Evening Standard), it has garnered international attention for its combination of unique historical research and stunning photography. Photo: Photo by Dr. Paul Koudounaris, tonight's speaker, from his new book "Heavenly Bodies." Must RSVP via sigrid.sarda(at)gmail.com to sign up. Wax artist Sigrid Sarda has returned for a special 2 day class teaching the art of doll making. This class will revolve entirely on the creation of a wax doll in the image of the student’s chosen saint with the relic of their choice. The wax doll represented as a human figure has always fascinated man. In early times these dolls were connected to witchcraft, magic, exorcisms for priests, and effigies. For this class they represent talismans and reliquaries for the student’s own personal interpretation of the saint’s meaning. The doll then becomes an object of prayer and veneration. Each student will receive a handmade wax doll by Sigrid, either male or female and in turn will learn to set eyes, root hair, color the skin tone and add special physical quirks the saint may have, an example being stigmata or a particular wound. The student will then realize their own decorated costumes for the saints using patterns in the art of Victorian paper clothes making for dolls. rooting hair, beginning of skin coloring and adding any special physical quirks. Materials are included though the student is expected to bring their own relic. The relic can be a lock of hair, a fingernail, bone, anything that has meaning to the student. The trims, spangles and paper for the costumes are either antique or vintage as are the glass eyes. The dolls will be approx 6"-8". Sigrid Sarda is self taught in the art of ceroplastics. She has been featured on such programs as The Midnight Archive, TV's Oddities, and has exhibited in London and NYC. She has an upcoming residency at The Gordon Museum in London, recreating the Black Dahlia for NoirCon 2014 and will be giving a demonstration in the art of medical wax moulage for The New York Academy of Medicine this fall. Includes: Two Day of the Dead Festivals; Special tours of The Museo de las Momias (Mummy Museum), The Museo Nacional de la Muerte (National Museum of Death), and The José Guadalupe Posada Museum, and a visit to historical Hidalgo market in Guanajuato, the Zacatecas Cathedral, the Temple of the Jesuit Order and other beautiful places. PLEASE NOTE: non-refundable down payment of $250.00 required by July 20 to reserve) Email info@borderlineprojects.com info [at] borderlineprojects.com with questions. This Halloween season, why not join Morbid Anatomy and Mexican scholar Salvador Olguín for a very special 4-day, 4-night trip to Mexico for our favorite holiday, Dia de los Muertos, or Day of the Dead? With Mexican writer and history of death in Mexico scholar Salvador Olguín as our guide, this tour will introduce attendees to some of the of lesser-known macabre destinations in Mexico holding unique gems associated with the culture of death. Our journey will take us to two off-the-beaten-track Day of the Dead celebrations, special tours of obscure museums, markets selling Day of the Dead and Santa Muerte artifacts, churches, cemeteries, and, throughout, great regional cuisine (and drink!) and luxury transportation. Departing from Monterrey, the trip will take us to the beautiful, historical colonial cities of Guanajuato, Zacatecas and Aguascalientes to experience an area traditionally described as wild and untamed within Mexico. This region of Mexico is uniquely important to the history of death in Mexico in that it was the home of both José Guadalupe Posada and Joaquín de Bolaños, author of the first official Mexican biography of Death La Portentosa Vida de la Muerte published in 1792. A plethora of stores and other places for shopping, delicious food, an evening tour of Guanajuato with live music included, and much more. We recommend arriving in Monterrey on the evening of Halloween, October 31. We will have a Halloween celebration, Mexican style, and we will depart to our first destination early in the morning of November 1st. We will convene in Monterrey, Mexico at 7:30 in the morning, and leave for the city of Guanajuato by bus. Mexico’s Museo de las Momias (Mummy Museum) makes the small Colonial city of Guanajuato the star of this tour. The Mummy Museum has been displaying the naturally mummified bodies of people buried in the local cemetery for almost 150 years. A combination of dry weather, a mineral-rich soil, and a potent concentration of minerals in the water makes every person who has lived and died in Guanajuato a potential mummy, according to local lore. The museum itself is a wonderful combination of the macabre and the kitsch. You can visit the actual cemetery and see real mummies, but you can also visit the ‘modern’ Halloweenesque section of the museum, and eat charamuscas, a sugary candy shaped like a mummy. Zacatecas, another small Colonial city in Northern Mexico, was the home of Joaquín de Bolaños, author of the first official Mexican biography of Death. La Portentosa Vida de la Muerte was first published in 1792, and was quickly condemned by the literary elites and some prominent officers of the Inquisition. The book managed to survive, and nowadays the City of Zacatecas honors Bolaños, its prodigal son, with a festival named after him around Day of the Dead. Cost: $600.00 USD - airfares not included, non-refundable down payment of $250.00 required by July 20 to reserve . Email info [at] borderlineprojects.com for questions. The $600 fee covers land transportation in a luxury bus, traveler insurance, lodging (double rooms at hotels), taxes, breakfasts, guided tours, tickets to all museums, special visits to some of the sites, and special treats. Full list and more information on all events can be found here. More on the Morbid Anatomy Art Academy can be found here. You can find out more about all events here. Photo Dr. Paul Koudounaris, from his new book Heavenly Bodies. Science Museum "Brought to Life"
Banjo Seth's Extraordinary Museum of the Wondrous!